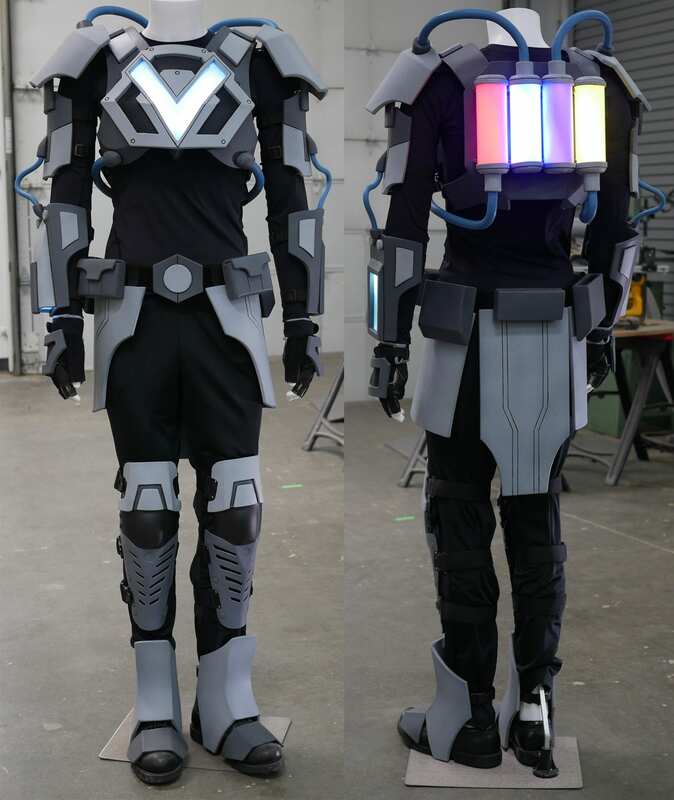 The Jazza VRtist costume now has lights! My main goal was to have the lights keep working for a full VR session. This meant having simple circuits with as little lights as possible for the longest battery life. Since I didn’t have much electronics experience, I didn’t plan ahead on how all the switches and batteries would fit into this armor. It seems like with more technical builds, the more planning the better. But, it’s hard to know what can be accomplished until you get a lot of practice. If I started the VRtist build over, I think I would try to wire all the electronics into one battery pack and switch. The down side would be adding wires, that unplug, to each joint. Plus, I would need to test the battery life of all the lights I planned on using, since these lights have to last through a VR session. If I had found hollow tubes, the wires could have been hidden inside and snaked around the armor pieces. For the forearm that looks like a flashlight beam, I could have used an actual flashlight, but the battery wouldn’t last that long and flashlights get pretty warm when they’re left on. Flashlights are also much more light than needed. A bright beam flashing around may be distracting from Jazza’s work. Adding pulsing lights to the costume would have been cool, but may have also been distracting. It’s a good idea to cover all the exposed metal bits of the system with heat shrink tubing and electrical tape. It’s amazing how much sweat can interfere with costume lighting. If you want to do repairs on the electronics later, covering everything in hot glue may not be the best solution. However, this armor is going to Australia. The hot glue should keep the wires from getting damaged in transit. The aluminium foil tape reflects enough natural light that all the parts of the costume that light up still look neat with the lights off, except for the back tubes.